Cold weather is just not my thing. I really shouldn’t complain because I have lived in colder climates but how nice would 75 to 80 degrees be year round? Tell me where I can find this place and I’m there! But in the meantime with cooler temperatures comes the need to warm up. 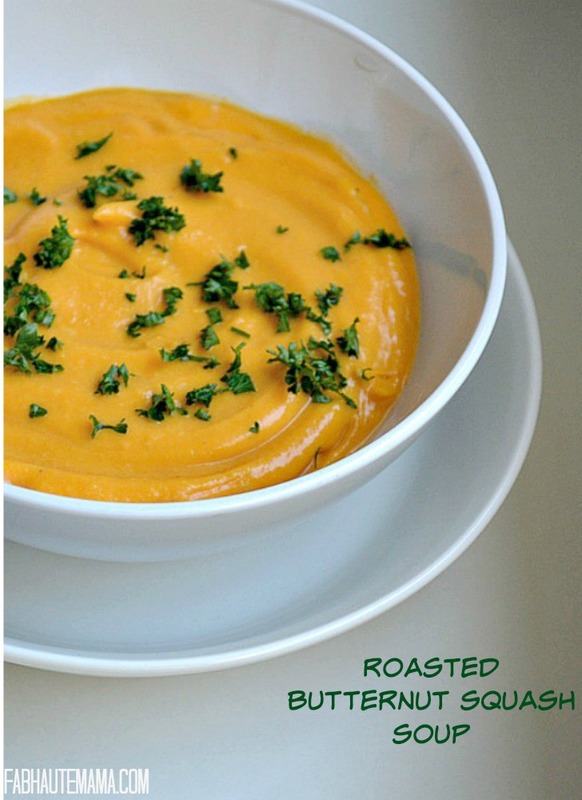 And what better way to warm up then with Roasted Butternut Squash Soup? There are a few extra ingredients thrown that makes this soup extra tasty and in my opinion better. LOL. Plus it’s National Soup Month! So why not enjoy a delicious bowl of soup. The best part of all is this soup is it’s toddler approved and it gives you a chance to get some great ingredients in for your picky eater. Sugar Plum Z isn’t really a picky eater however she has been known to have days when she wants nothing but porridge and fresh fruit. 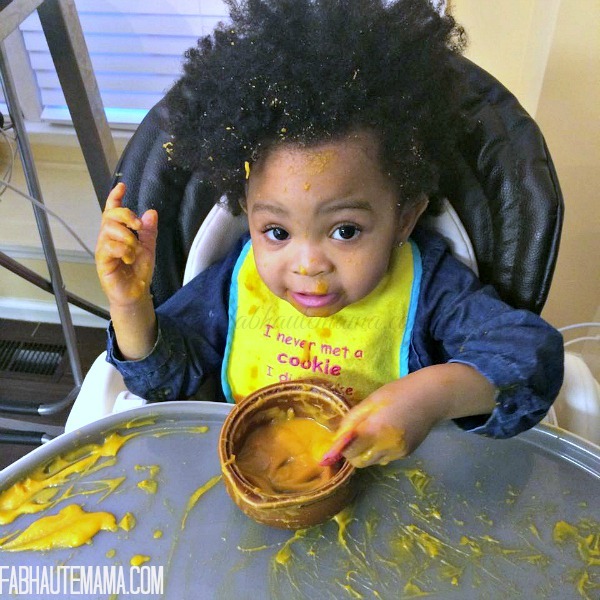 This happens to be one of those weeks so when she zeroed in and devoured her soup I was a happy mama. Score Mama 1 – Toddler 0. She also made artwork and hair conditioner out of her second serving. Yep she evened the score and left me with a big cleanup job but the soup was a hit so it’s a win all around. So what are the bonus ingredients that give this butternut squash soup extra flavor and make it a big toddler win: A baked sweet potato and a granny smith apple plus my one of my favorite spices. I also threw in a few splashes of Tabasco and Worcestershire Sauce. Another hilarious moment was when the soup overflowed from the blender. Sugar Plum Z was so delighted. Just call her the clean-up crew. She cleaned up by eating the spilled soup right off the counter while shouting “yummy mommy.” All I could do was laugh but that is also the moment I knew the soup was a hit. Line a baking sheet with aluminum foil. Place the squash pieces cut-side up on the baking sheet. 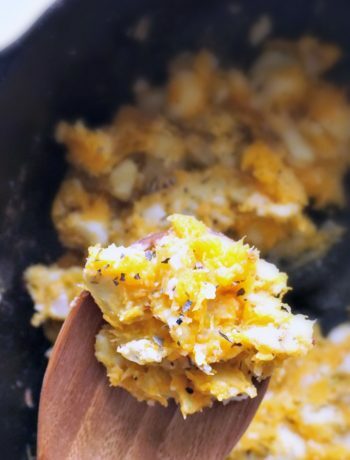 Melt 1 tablespoon of the butter and brush all of over the squash. Season with salt and pepper. Wrap sweet potato in foil paper and place along side squash. Roast until fork tender, about 50 minutes to 1 hour. Peel, core, and cut the apple into medium dice. Cut the onion into medium dice. Melt the remaining tablespoon of butter in a large saucepan. Add the apple and onion, season with salt and pepper, and cook, stirring occasionally, until softened, about 7 minutes. Set aside. Add the broth, water, Tabasco sauce, Worcestershire sauce, salt and pepper, stir to combine, and bring to a boil over medium-high heat. Reduce the heat to medium low and simmer for 15 minutes. Remove from heat, discard bay leaf and stir in the cream. 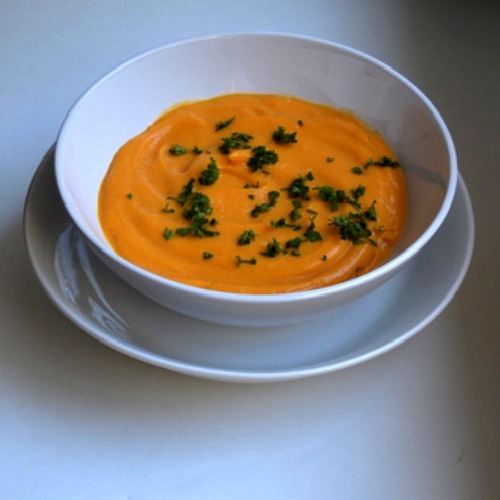 Using a blender (with pour lid removed), purée the soup in batches until smooth, Taste and adjust seasoning. What’s your favorite soup for chilly weather? I love butternut squash soup. I’ve never tried it with a sweet potato, but it sounds good. Unfortunately, I’m the only one in my house that eats it. 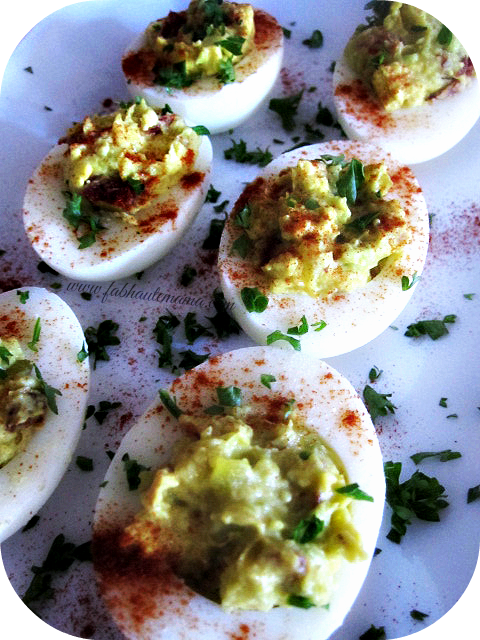 So I don’t make it as often as I would like but I’m going to try this recipe out next week. Substitute it with all sweet potatoes if that’s what your family enjoys. Use 4-6 potatoes depending on the size of your family. You will love it Vee. The extras give it a nice flair. You can also substitute the squash for all sweet potatoes. You will need 5-6 potatoes. Zoe is a mess! Looks delicious! Plus I love that your daughter made it a dinner/hair conditioner combo! Ha ha ha! 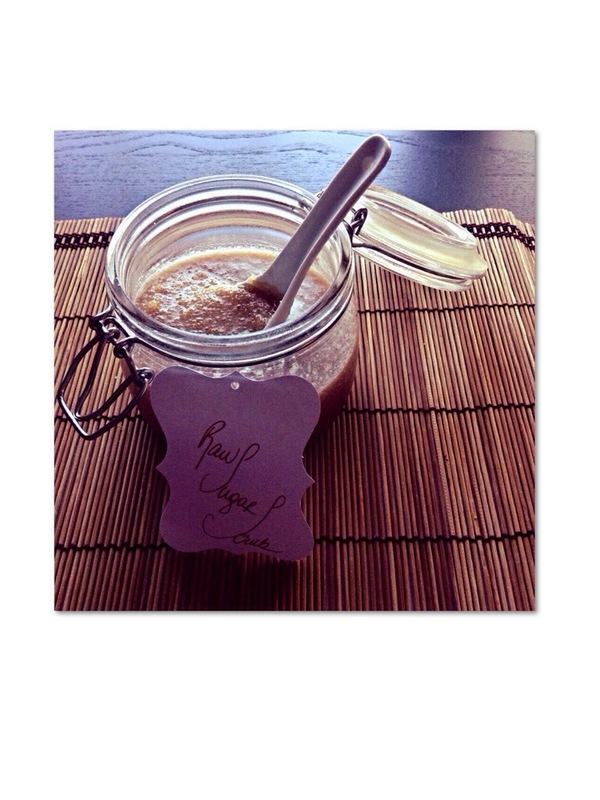 Tracy Gibb recently posted…Healthy Eating Tip: Replace Dessert With @Yoplait Greek 100! Thanks Tracy and LOL. Yep, it doubles as hair conditioner. Your daughter is adorable!! I love Butternut Squash and never thought to add an apple to the soup!! I am going to have to try this out sounds like the perfect combination! I bet this would be great to make a big batch of and freeze extras for later. Thanks Tammi. The soup is definitely a good one to freeze. I usually freeze a batch but we ate it all and a little leftover for the next day. Girrrrrlllll this soup looks amazing! I just started using butternut sqush in recipes and just made some soup a few days ago. But this…sweet potato and apple on my! Can’t wait to try it out 🙂 I’ve saved the recipe! Christine St.Vil recently posted…[Be Well Experience] How to Be Happy, Healthy, & Wealthy NOW! Do it Christine. You won’t regret it. I promise. Oh, I love this. I’m going to have to try this recipe for the kids. Thanks Adanna. I think your babies will love it. This soup looks awesome. I usually don’t eat squash, but you have me thinking twice! Cute baby too! Thanks Stacie. Give it a try. You can also roast 4-6 sweet potatoes and make it without the squash but the squash is yummy! I promise. Yummy, it’s great to get new recipes for a non-cook like me lol. Thanks. I hope you make it Nicole. It really is easy. Hardest part is waiting for the squash & potato to bake. That looks thick and yummy. 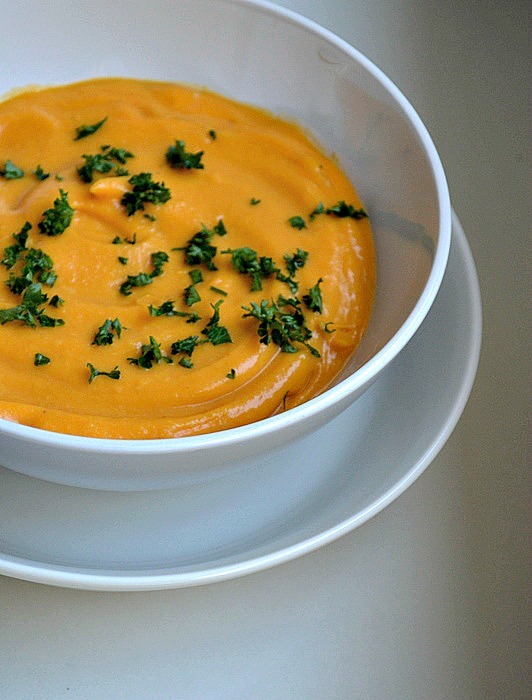 I actually have some sweet potato soup in the pantry. I may make this soup and blend it in because it doesn’t’ seem to be as thick as this would be! I guess the two would complement each other well. I love that pic of your daughter! My son would never have done that, he took the fun out of it all! Yes the sweet potato definitely added some thickness to the soup. Give it a go and enjoy.